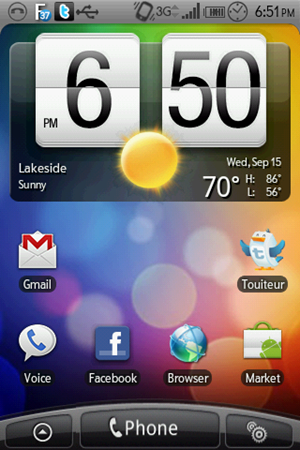 XDA-Devs forum member JAguirre1231 has put together a theme for ADWLauncher that makes it look pretty similar to the Sense UI launcher found on HTC devices. Unfortunately, at this point only MDPI devices are supported (for those who don't know, MDPI is for lower-resolution phones, while HDPI is for phones such as the EVO, Epic, and Droid series). However, JAguirre says in the thread that he's planning on making an HDPI version as well. Is it perfect? No, but it's damn close. If you want to take the jump, be sure to hit up the source link and follow the directions closely. Let us know how it goes! Verizon’s Motorola Droid X Froyo Update Causing Issues?